The Balanced Rock Regulators are the new Carbon County chapter of the Single Action Shooting Society, Inc. (SASS). Cowboy Action Shooting has been officially in existence since 1991 when Don Burge and Duane Taylor started the group with SueAnn Martell as the unoffical secretary. Cowboy Action Shooting was formed in Carbon County, Utah when Don became tired with the repetitive nature of IPSC shooting -- so they started wearing cowboy clothes and then later shooting IPSC with cowboy weapons. It grew from there... for a while we operated under another name, but things changed as that group suffered from personality, legal and operational/proceedural issues. In June of 2007, 4 of the 6 Officers resigned from the old Posse and formed the completely NRA & SASS sanctioned and fully insured Balanced Rock Regulators, LLC. Cowboy Action Shooting is the nation's fastest growing sport. For SASS, you are armed with two revolvers, a long rifle (using pistol calibers) and a shotgun -- all loaded with "soft" lead. Side matches also exist, such as Buffalo Rifle long range using authentic Cowboy Rifle calibers and Derringer Fast Draw and Derringer Long Range. 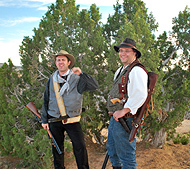 Shooters go out and terrorize steel targets while reliving the old west. Safety is our prime concern! But that doesn't mean we don't have fun. Among other things, we have a Texas Star whirly gig target and a large collection of knock-down reaction targets. 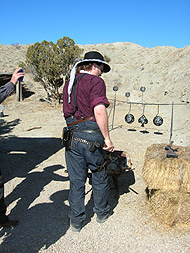 Although a shooting sport, SASS is also about keeping the Spirit of the Old West alive. Members go to great lengths to choose historically "appropriate" names, dress in costumes and shoot custom designed "stages" that have a historical and sometimes educational bent. 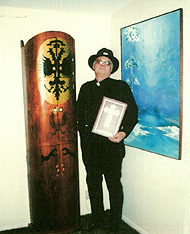 And we are in the perfect area for that historical bent -- our area has a long and prestigious history of the Old West. In fact, our new Cowboy Shooting Range is named after the town where Butch Cassidy and Elza Lay robbed $8,000 from the Castle Gate Payroll. It's even a fact that the Sundance Kid was NOT involved in the planning or actual robbery! The cowboy town is not named after the Posse, but for the actual Castle Gate town. Why was the original town called Castle Gate? Because of the two natural stone towers that stood over it. Carbon County is full of unique geologic features... our group is named after the Balanced Rock that sits over Helper, Utah. We meet every third Saturday of the month. We now have a new and very expansive cowboy town at the new Carbon County gun-range, thanks to our forward thinking County Commissioners. 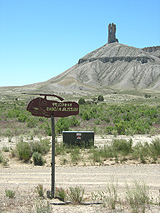 It is nestled in the rear hills of Carbon County's North Springs Shooting Range. The Castle Gate Town features full two-story building fronts covering 16 bays and a "hospitality shack" with electricity, a full kitchen and much needed bathrooms. It's quite an impressive improvement over our old and much loved range. It's also the biggest cowboy town in the region -- and that includes other states! NOTE: June 2008: Due to the on-going North Springs Shooting Range Soap Opera, the Balanced Rock Regulators are not currently supporting, endorsing nor using the North Springs Shooting Range! It's not uncommon for the Balanced Rock Regulators shoots to be a gathering for old friends to meet. We have a regular membership who travel monthly from not only our local Carbon County area, but also the Utah areas of Provo, Emery County, St. George, Logan, and the even farther areas of Wyoming, and Grand Junction, Colorado! Our newsletter, The Wire! keeps our members and interested people up-to-date on Balanced Rock Regulators' events and happenings. Previous copies of The Wire! can be found here. Or you can e-mail us and ask to be included on our mailing list. 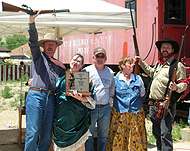 A long time supporter of the historical and re-enactment community, the Balanced Rock Regulators members have participated in the Western Mining & Railroad Museum's Annual Heritage Week for the past three years. The Regulators participate by holding staged shootouts in the street. This has gained the notice of TrueWest Magazine -- who named Helper in their Top 10 True Western Towns for two years now. We have also been actors in KUED documentaries. In 2006, a re-enactment of the robbery of the Kenilworth Mercantile was staged for the town of Kenilworth's 100th Anniversary. We have received multiple requests to re-enact it again. Best of all, you don't have to buy the outfits or all of the guns to get started -- in fact we encourage people to try different firearms and activities to see what they like! Balanced Rock Regulators members have no problems with loaning weapons to new comers while they are at Castle Gate Town and we keep a supply of club ammo to shoot. Hey, over 80,000 registered SASS members can't all be wrong! Whether you're just curious, wanna throw lead downrange, or wanna shoot Hollywood smoky blanks and play an outlaw (or an in-law) we'd love to see you! Unless there is a special event or holiday, we shoot every third Saturday of the month. Our next shoots are..
June 21, 2008 -- Summer Hours... Setup @ 8am -- Shoot @ 9am... at the Pinnacle Peak Range. To get to the Pinnacle Peak Range... At Price, Utah Hwy 6&191 Exit #240 (Castleview Hospital Exit) go West on Westwood Blvd up hill and through a residential area. Look for two giant wind turbines... the next intersection is a 4-way, turn West on Gordon Creek Road. After .4 miles you will come to two batches of mailboxes and a 30 mph speed limit sign... turn left (South) on a dirt road for .1 miles. Turn South again on Pinnacle Peak Road (still dirt). If you go up a rough hill, you're on the wrong road. Drive on Pinnacle Peak Road for 1.9 miles... watch for Gas Well Trucks as they tend to go real fast even on dirt roads. Once you are directly beside Pinnacle Peak, there will be a dirt road to the NW (on your right)... this is the range entrance, there is a metal sign that says Bookcliff Muzzleloaders... we are straight back. This is a primitive range... bring water, camp chairs, tables, shade and lightweight clothing. Member looking to buy a used .45LC lever action rifle in good condition for himself and his wife. New for sale: a pair of batwing chaps for $100. Captain Tim says that he'll modify them to fit all heights of Cowboys and Cowgirls. Balanced Rock Regulators' new "recruitment" poster now available as a bandwidth friendly download. Yes! : I want to send an email and receive copies of The Wire! in my email box.